This was the third Texas Association of Museums meeting that I have attended. There is always loads of great lectures, but meeting and talking with people involved in museums and obsessed with history is the real joy of the meetings. 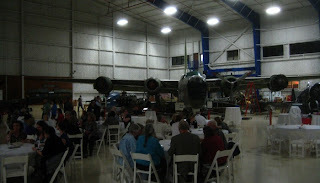 This year the TAM meeting was held in Galveston, so the evening social events included h’orderves and wine at the Bishop’s Palace, Freeto pie at the Galveston Art Center, grilled shrimp at the Ocean Star Drilling Museum, and on the final night, dancing under the wings of B 52 bombers at the Lone Star Flight Museum. How can you not love history! So I called the cats in for their dinner. As they were dancing and begging at my feet I noticed the red dots on the floor. Lots of red dots. More and more red dots! They were coming from the tip of Chucks tail! 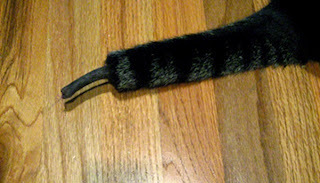 Somehow he lost the end of his tail and he was flinging blood everywhere. He didn’t seem to be in any pain, but the kitchen was starting to look like a murder scene. So I rushed him to the “late night” veterinarian, and they shaved his tail and put in a few stitches, then charged me $568.00. When we got back home at 11:45 PM Chuck was really really hungry and I needed a glass of wine.